Extend audio and high resolution video from a single point to multiple destinations up to 1000 feet over CAT 5 cabling. 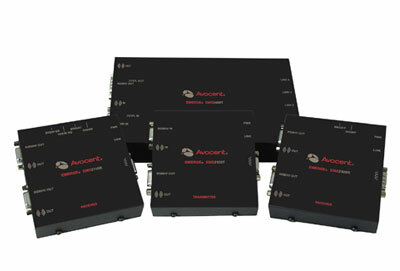 The Avocent Emerge EMS2000 series is a range of audiovisual extenders delivering high video resolutions, superb quality audio and RS-232 up to 1000 feet (300 m) using standard CAT x cable (x=5, 5e, 6, 7). The innovative design allows for extensible distribution of audiovisual and control signals to display devices such that deployments can grow in line with future needs. The Emerge EMS2000 series makes the design of digital signage applications cost effective, flexible and easy to deploy. Video Performance - Industry leading resolutions of 1600 x 1200 are achievable at 650 ft (200 m) and 1280 x 1024 at 1000 ft (300 m). Display Management via RS-232 - EMS2000 transmitters allow for bi-directional and automated communication with individual screens, or all screens at the same time. Video Compensation and Brightness Control - The Emerge AV extenders can apply a high level of signal compensation and brightness correction that ensures the image is crisp, clear and bright over long distances. Audio - Digital audio extension of analog audio signals delivers high fidelity; click-less audio for speakers and microphones. Integrated DeSkew - The Emerge EMS2110R has integrated skew correction with a 300MHz bandwidth, meaning that it is more than powerful enough to counteract the negative effects of the skew. * EMS2100R and EMS2110R units only have a single RS-232 interface, but optional cable is available allowing connection to two screens.